HomeAnimalsCuteMost PopularThese abandoned baby orangutans on a ‘school run’ are wheely cute! These abandoned baby orangutans on a ‘school run’ are wheely cute! These heart-warming photographs show a school run with a difference. 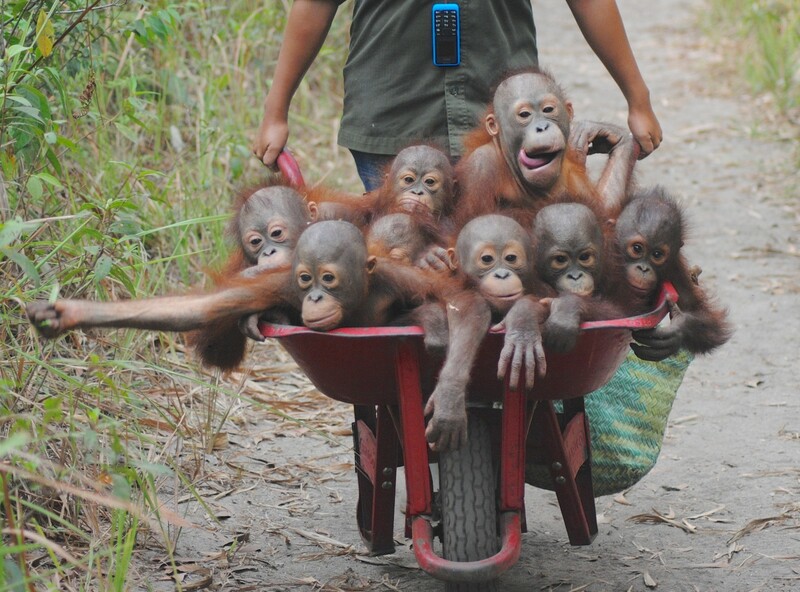 Every day conservationists take a group of abandoned baby organutans on wheelbarrow run into the jungle for lessons on how to survive in the wild. The little youngsters are taught the skills which should have been gained from their mothers but unfortunately they were left to fend for themselves before being rescued. Thankfully International Animal Rescue in Indonesia are there to help and they wheel the youngsters each day to the ‘forest school’ for them to take their first baby steps. Their adorable school run shows up to nine of the little ones looking happy huddled up while being easily transported to the baby school. Heartwarming pictures show the baby Orangutans in a wheelbarrow going to their school classes on how to survive in the wild in Indonesia. 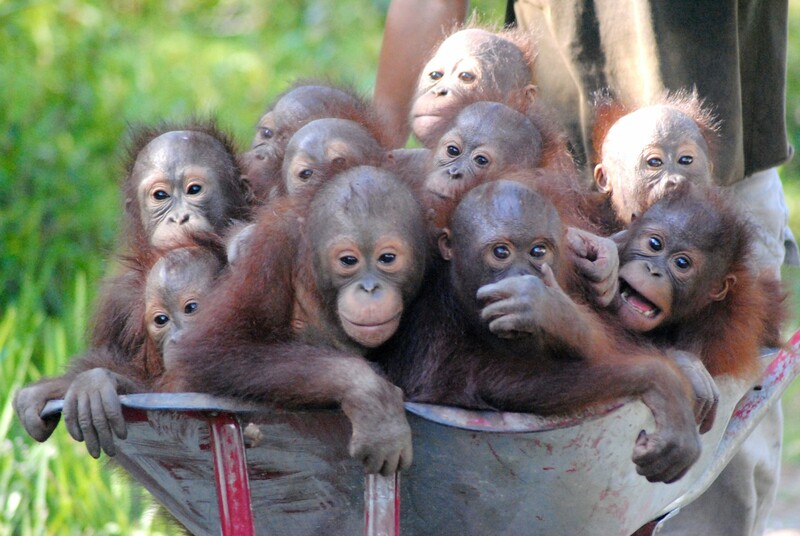 Heartwarming pictures show the baby Orangutans in a wheelbarrow going to their school classes on how to survive in the wild in Indonesia. See Masons copy MNSCHOOL:The little youngsters are taught the skills which should have been gained from their mothers at International Animal Rescue’s school in Indonesia. 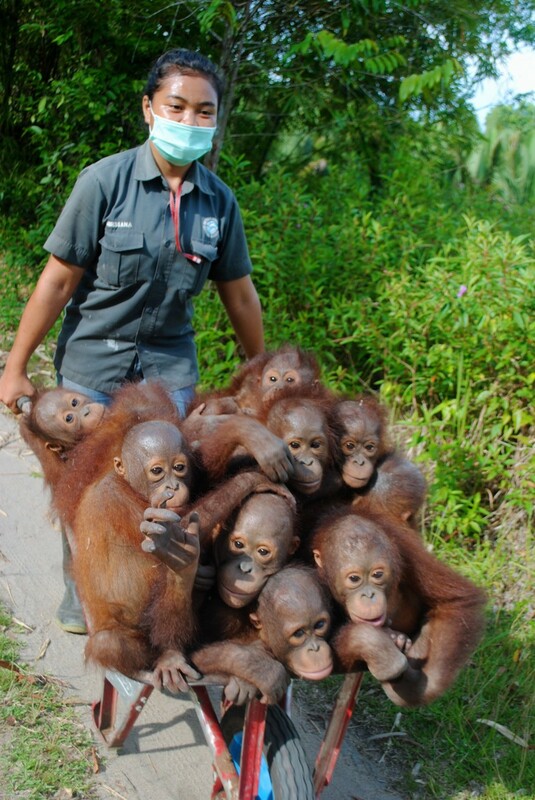 Their adorable school run shows up to eight of the little ones huddled up while being wheeled to the ‘baby school’. Orangutans usually spend seven to eight years with their mother and learn the skills they need to survive. Orangutans usually spend seven to eight years with their mother and learn the skills they need to survive. So the charity have created an environment as close as possible to what life would be like in the wild for them where they can learn from each other instead. Alan Knight, CEO of International Animal Rescue, said: “As time goes on they will learn from the other orangutans how to climb and forage for food, just as they would in the forest. “Young orangutans learn a great deal by imitating and copying each other, just like human children. The charity in Keptang, Indonesia, have built the forest school where the youngsters can climb and swing from the ropes and barrels. The sanctuary aims to return the animals to the wild once they are fully rehabilitated. « Previous post Choc Horror: You'll never believe what happened when this woman applied a chocolate face mask.